Using traditional silversmithing tools and techniques, I create contemporary handcrafted sterling silver jewellery, funky copper creations & beautiful gemstone jewellery. All of my designs are original, many are one of a kind and all are handcrafted by me at my studio near Croyde Bay. Thanks for stopping by . . . I hope you find something you love! Absolutely beautiful little stone, and I love the silk cord - it's very unusual and understated. Great seller communication too and easy to request a slightly longer length. 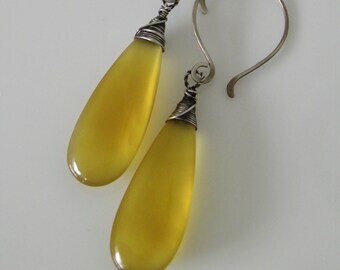 Gorgeous earrings, really light and easy to wear. Glorious Gemstones . . . I love them! Love Makes The World Go Round . . . and a bit of bling makes for a more sparkly ride! Collections from my Iddy Biddy Boutique. WELCOME to my Iddy Biddy Boutique! I am based in Croyde Bay, North Devon, on the South West coast of England. I have been making jewellery for as long as I can remember! Literally, threading beads as a toddler, which progressed to bending wire as a teenager and selling my own jewellery designs from a young age. Basically, I love jewellery . . . my head is constantly bombarded with ideas of new things to make. I am very proud of the jewellery I create, I always use the finest quality materials and take the time to make sure each piece is beautifully crafted. If somebody gets pleasure from wearing a piece that I have created, then I am delighted! I am particularly inspired by contemporary designs. 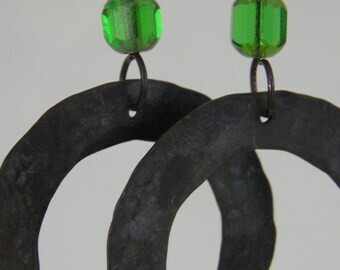 Many of my designs are made using thicker gauge metals, as I like fairly chunky solid jewellery. I love working with sterling silver, fine silver and copper, all of which I will often oxidize to give that soft dark patina . . . . which looks great for a more rustic natural earthy look. I am a self confessed faceted bead freak, glass crystal or gemstones . . . I adore them! I am often asked where I get all my ideas for my designs . . . the answer is EVERYWHERE . . . I am inspired by life! All of my designs are handcrafted by me in my home near Croyde Bay. I am totally chuffed when somebody chooses to buy a handcrafted item from my Iddy Biddy Boutique. If for any reason you are not delighted with your purchase, I will do my best to sort out any issue to your satisfaction. Should you wish to return an item, I ask that you inform me asap. Items returned must be posted within 14 days of receipt and at the buyers cost. 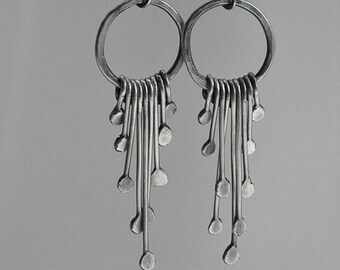 For hygiene reasons, earrings can only be returned if they are unworn. I accept payment by Pay Pal and Etsy Direct Checkout. All of my jewellery is ready to ship & I will endeavor to post your purchases within 3 working days . . . though items will usually be shipped the following day. Let me know if you need the item in a real hurry and I will leg it to the post office asap. . . . . within the UK all items are sent via first class mail. . . . . everywhere else items are sent via airmail. Although International shipping should take 5-10 days . . . please order in plenty of time and allow up to two weeks. Please note that customers are responsible for any customs or taxes associated with shipping internationally.